Lady Alice, the 87 Johnson Motor Yacht 2005, is designed by renowned naval architect Bill Dixon,has an on deck master suite with over 270 degree forward view,4 staterooms and low hours (less than 800)on CAT C-30s with extended warranties.The large teak upper deck bridge is protected with a hard top and lots of space, including built in settee for 8, teak table, s/s BBQ, davit, bar with granite counter top & ref/ice combo.Twin CAT C-30s. Wide beam, on-deck master. 4 Stateroom plus 3 crew berths. Walk around decks plus garage for toys. United Yacht Sales New Jersey would love to guide you through a personal showing of this 87' Johnson Motor Yacht 2005. 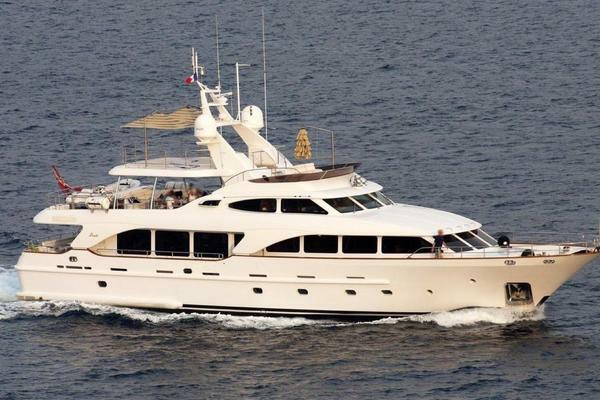 This yacht for sale is located in Ft. Lauderdale, Florida and priced at $2,697,000. For a showing please contact us by filling out the form on this page and we will get back to you shortly! 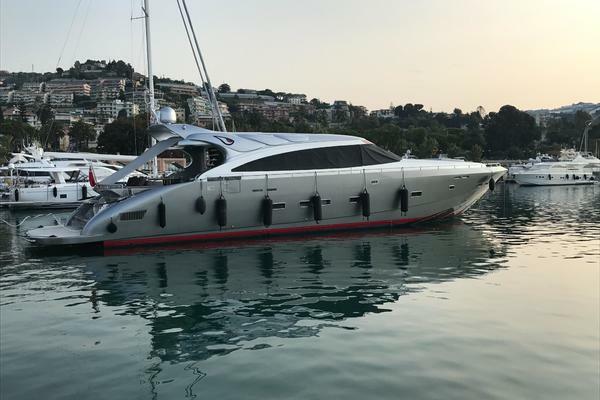 Designed by renowned naval architect Bill Dixon, with super yacht styling and wide beam (23'6"), the volume of interior space is incredible. She has an on deck master suite with over 270 degree forward view. Her VIP is big enough to be the master. She is also equipped with 2 guest staterooms, (a total of 4 staterooms). Low hours on CAT C-30s. There is a Crew cabin for 3 and a garage for two jet skis or dinghy. There are large, full walk-arounds as well as a protected aft deck with settee for 8 and teak dining table. The large teak upper deck bridge is protected with a hard top and lots of space, including built in settee for 8, teak table, s/s BBQ, davit, bar with granite counter top & ref/ice combo.